This is an archive of true stories about life in Coventry during the Blitz, as told by survivors and by the friends and families of victims. I would like to add as many Blitz memories as possible to this archive, in order to preserve history for future education, and to honour the memories of those who were killed by the bombing raids. If you have any interesting memories or family stories of wartime Coventry or the Blitz please email them to met and I shall be happy to add them to my site. Any wartime snapshots would also be much appreciated. Blitz memory from Ruth Kennedy. 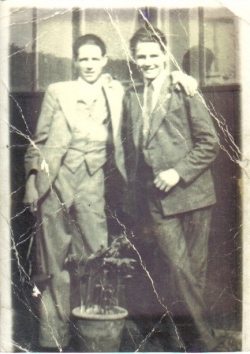 My mother's two brothers, Denis and Edward Brown, were killed on the same night during the Blitz. The story told by my mother is that Denis was fire watching when he received a direct hit. His younger brother Eddie went looking for him, borrowing his step-brother's (Harry's) bicycle to do so. Harry warned him to make sure nothing happened to the bike. Eddie went to Stoney Stanford Swimming Baths, where he had heard that the survivors had been taken. He left the bike outside and went in to the Baths, which itself then received a direct hit. So both brothers were killed on the same night - but I believe the bike was unharmed. Mum was away at school at the time (The Birmingham Royal Institute for the Blind, which had been evacuated to Bockleton Manor) and so was not told of her brothers' deaths until she got home at Christmas. Denis (on the left) was quieter and slimmer, with dark hair and loose curls. Eddie was livelier and more solidly built, with tight curls. 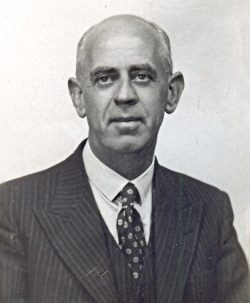 Gilbert John Griffiths (Assistant Engineer - Post Office Coventry) was awarded the George Medal for bravery during the Coventry Blitz. Gilbert was off duty that night, however he bravely cycled the 1.5 miles from his home during very heavy bombing. Once there he assisted his colleagues William John Williams O.B.E and John William Wilkins O.B.E in restoring communications which had been severed, and maintained them throughout the bombing. This helped bring outside help to Coventry much quicker. When the fire finally reached their building, Gilbert and his colleagues fought the fire themselves. William collapsed from smoke inhalation and had be carried to safety by Gilbert and John. When fire again threatened the office they managed to contact the Fire Brigade who saved the building. It was vital during the raid to maintain communication for civil defence purposes and this was only achieved because of the bravery of Gilbert and his colleagues. This blitz story was kindly brought to my attention by Gilbert's niece Mary. As a thirteen year old at the time I well recall that every time the sirens went in the evening or night, throughout the war, without fail my father would leave home and walk to his office, only returning after the all clear sounded. Of course I didn't question this at the time and took the procedure as normal. The morning after the raid my mother and I walked to his office to ascertain if he had survived, Although there was an unexploded bomb in the street we were allowed past the cordon and were thankful to meet him. Both my mother and I were able to see his presentation at Buckingham Palace. A few years ago I donated my father’s George medal to the Herbert Museum in Coventry together with a copy of the Coventry Evening Telegraph which contains a report of the award. From the author of ‘Wartime’ comes an outstanding history of the most sustained onslaught ever endured by Britain's civilian population – the Blitz. September 1940 marked the beginning of Nazi Germany's aerial attack on civilian Britain. Lasting eight months, the Blitz was the form of warfare that had been predicted throughout the 1930s, and that the British people had feared since Neville Chamberlain's declaration that Britain was at war. Images of Britain’s devastated cities are among the most iconic of the Second World War. Yet compared with other great moments of that war – Dunkirk, the North African campaign, D-Day – the Blitz remains curiously unexamined. Apart from fragmentary accounts and local records, there is little in the way of a comprehensive account of the experience that so many British civilians went through – as well as the social, political and cultural implications of the bombardment. Designed to break the morale of the British population, the nightly bombings certainly did devastate. But, as Juliet Gardiner shows in this hugely important book, they also served to galvanise the nation; from those terrifying eight months, a new determination amongst people and politicians steadily emerged.